This week’s lesson is a typical Adventist study on a life of good works and compassion as patterned after the life of Christ. Although the lesson states that our good works do not contribute to our salvation, nevertheless they are the mark of loving Jesus. On the surface, these words are true. Under the figurative hood, however, the Adventist definitions change what these words mean in Christian circles. Adventists build their case for good works by looking to Jesus as an example. His compassion and love for all people, regardless of their ethnicity or socio-economic status, is the pattern which one should follow, according to Adventist logic. What this argument lacks, however, is the underlying reality that the best and most pious good works are counted as valueless as garbage, according to Paul, unless we are born again and living IN Christ, not just by patterning ourselves after Him (see Philippians 3:1-11). People who are still dead in sin can do immensely altruistic acts and can give their fortunes to charity, but they count for nothing in God’s sight as far as salvation goes. Only those who are born again and living by the Spirit are capable of doing the works of God. Saturday’s lesson includes an Ellen White quote admonishing readers to “follow the sample set by Christ, and make Him our pattern, until we shall have the same love for others as He has manifested for us” (p. 77). This quote leads only to despair. No amount of patterning oneself after Christ will ever yield His love in our hearts. Only dying to ourselves, only repenting of our sin and receiving the washing of Jesus’ blood for our hopeless spiritual death will give us Jesus’ love, because only when we repent and receive His forgiveness are we regenerated by the Holy Spirit and made alive with the Life of Jesus Himself. His love becomes our love because He indwells us, and He loves through us as we trust Him. This assessment diminishes the obedience of Jesus to die on the cross. His death was not a demonstration to the universe. Adventists teach that it was the ultimate demonstration of love, but that explanation eviscerates the crucifixion. Jesus died as a propitiation for our sin. His sacrifice of Himself, and the Father’s sacrifice of His only Son, was a satisfactory and sufficient sacrifice for all human sin. Jesus’ sacrifice was the unique and only sufficient sacrifice that could pay for human sin and turn away the wrath of God from sinful humanity. Jesus’ death was the only thing that could reconcile us to God. His death was NOT an example or a demonstration. He was not showing self-abnegation by allowing people to crucify Him instead of retaliating against them. He was not demonstrating self-renunciation for the purpose of demonstrating the humility we are supposed to have. He was paying for human sin with His human death, taking into Himself the sin of us all and becoming what the Father hated (2 Cor. 5:21) as He became sin for us. Our sin separated Him from His Father. It is this non-duplicatable sacrifice of Himself that demonstrates God’s love and which is the way He loved us. This death is what Jesus meant when He said His new commandment was for us to love one another as He loved us. That love is sacrificial. To love as He loved us means we live our lives willing to surrender them to the Father for the sake of the gospel and the saving of souls if He requires our death. Only those who are alive in Jesus can love like this, because only they literally have the Lord Jesus indwelling them in the person of the Holy Spirit. Today’s lesson addresses loving our neighbors. The primary text used is the story of the Good Samaritan and ties this lesson to the Old Testament command to love the Lord and to love one’s neighbor as oneself. The primary point is that Jesus clarified that loving one’s neighbor does carry an implied opposite: hating one’s enemies; instead, it carries the revelation that anyone in need is our neighbor, and we must love him or her. To be sure, Christ-followers do care for those in need, but the underlying point of the Good Samaritan story was far more profound than simply one must care for the needy and not feel superior to them. The audience to whom Jesus told this story considered the Samaritans, half-breeds between the northern kingdom Israelites and the native Canaanites, to be untouchables. Jews did not pass through Samaria nor fraternize with Samaritans in any way. For Jesus to tell this story, He had to arouse all the social outrage of the educated Jews to whom He spoke. They knew the Old Testament forbade them from interacting with anyone but fellow Israelites. In fact, their fold laws established a barrier that made it impossible for any social interchange to happen with anyone outside Judaism. This separation was God’s law for them. When Jesus, therefore, portrayed the one loving his neighbor as being an unclean Samaritan, He was seen not just as illustrating a point about a big heart filled with compassion, He was chipping away at their social rules that were firmly embedded in the Old Testament. Jesus was saying that it was possible for a Samaritan “dog” to have a heart that reflected God’s love, and that a Samaritan could honor God better than an arrogant Jew could. This story wasn’t primarily about identifying one’s neighbor as anyone needy. It was about identifying one’s neighbor as being an untouchable Samaritan who might care for a needy Jew—and the interchange would be honored by God because the Samaritan acted with the selfless love that comes from honoring God. This story was demonstrating that the kingdom of God was breaking down the social barriers erected by the Law, and it angered the Jews. Jesus was showing that God’s own law for Israel was superseded by a heart that honored God, and that God would honor an untouchable Samaritan if he lived with God’s integrity. Again the lesson misses the point. Jesus never knew those who are turned away not because they failed to love; rather, they failed to love because He never knew them: they had never been born again. When we are born again of the Spirit (Jn. 3:3-6; Eph. 1:13-14), we then know God. He literally indwells us. Our knowing of Him and His of us is profoundly intimate; it comes from being closer than two people in a room. This is intimacy that is created by literal indwelling of God in man. Those who do all manner of good works without being born again do not know God, no matter how much pity or sympathy they may feel. Only Those who KNOW Jesus and who are known by Him are able to be saved. Only they are able to do works of compassion that flow from the Lord Jesus’ heart. Again, it is impossible to learn to love our enemies unless we are born again. Looking to Jesus as an example is utterly hopeless to change us unless we are alive in Him. His life is an example to us AFTER we have been transferred out of the domain of darkness into the kingdom of the Beloved Son (Col 1:13), but not before. Living like Christ is not a process we learn by studying the life and behaviors of Jesus. He was not primarily an example; He was our Substitute and the Sacrifice that completed all that was necessary to atone for human sin. He came to die, not to show us how to live. To look at Jesus as a great teacher with good modeling is to miss the point entirely. Jesus is our Savior. Once we have repented and submitted our lives to Him, we receive His Spirit and can begin to live by His Spirit. But we do not learn to live as Christians by examining the life of Jesus. We learn how God sees and defines reality by reading about Jesus, but if we want to learn how to live as Christians, Paul’s epistles are the places with the instructions for us. The gospels are accounts of Jesus, not models for us. Paul’s epistles, on the other hand, are God’s word to the church. In them we learn what it means to live as part of the body of Christ. In them we learn how the New Covenant works, and we learn how Jesus’ sacrifice broke down the dividing wall between Jews and Gentiles and makes us One Body in Him (Ephesians 1 through 3; Romans 1 through 8). First, God’s purposes are never frustrated. He is sovereign, and our personal pettiness and selfishness will not and cannot frustrate His purposes. Second, we do not learn to be like Christ by submission of our will. We become like Christ by repenting and being born again and learning to trust Him and to live by His word. Being like Jesus is not a disciplines we learn to do by will-power and hard work. It is something Jesus works out in us by teaching us what reality is in His word and teaching us to trust His will as revealed in Scripture. Third, the lesson repeats that we must accept Jesus’ death for us daily. This instruction again betrays the fact that Adventism does not understand nor teach the new birth. When we are born again, we cannot be unborn. We are alive. We are immature at first, but we are alive. We have to mature by learning to eat the meat of the Word and by allowing the Holy Spirit to teach us how to live by the Word. We further need to live with thankfulness for Jesus’ constant presence and provision. But we don’t re-accept His sacrifice over and over as if we can fall out of salvation and must work our way back in. We must repent in an ongoing way of our sins, but we do not lose our salvation once we are born again. Jesus indwells us the moment we believe, and He never leaves us. He indwells us forever, and His Spirit convicts and teaches us to trust Him and to submit when we are tempted. The joy of Jesus in our hearts is a promise to all who believe and are born again; it does not depend upon success or victory; it depends upon trust Him and doing what He asks His followers to do. It comes from knowing He is with us and that He explains in His word the reaction of the world to us. As usual, today’s lesson consists of Ellen White quotes and discussion questions. Instead of reading Ellen White, read the book of Ephesians. 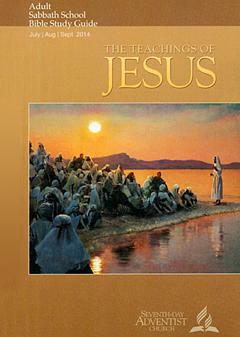 It is only six chapters, but it is a profound treatise on salvation and on the body of Christ. In this book you will find the indicatives that are true for all who know Jesus, and you will find the imperatives for all who are born again. And don’t forget: no one can perform the gospel imperatives until they have repented and received cleansing from Jesus’ blood shed for their sin. Then, when they have been born of the Spirit, they are empowered to begin living a completely new life! Copyright 2014 BibleStudiesForAdventists.com. All rights reserved. Revised August 11, 2014. This website is published by Life Assurance Ministries, Camp Verde, Arizona, USA, the publisher of Proclamation! Magazine. Contact email: BibleStudiesForAdventists@gmail.com.